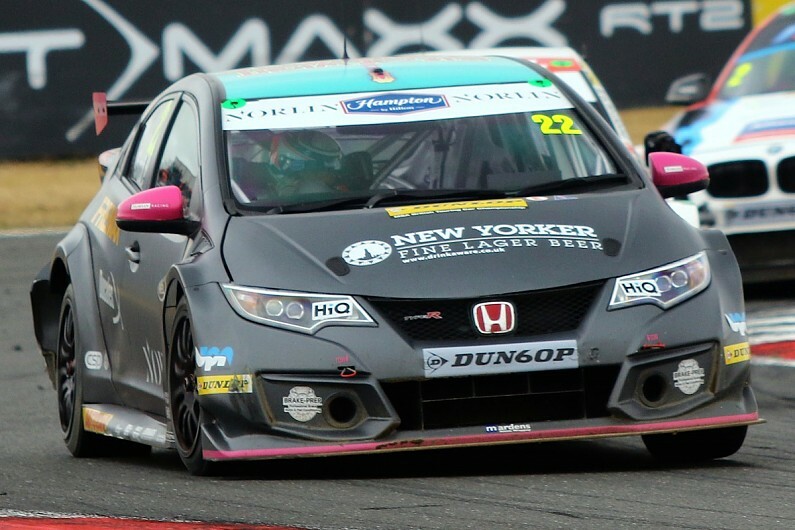 Chris Smiley won the final British Touring Car Championship race of the weekend at Rockingham to break his victory duck in the BTC Norlin Honda Civic. The Northern Irishman snatched the lead at the first run through the hairpin – which was slipper after a pre-race shower – when polesitter Tom Chilton (Motorbase Performance Ford Focus) was first to approach the corner and ran wide. He was followed onto the grass by Matt Simpson (Eurotech Racing Honda Civic Type R) and Team Hard Volkswagen CC driver Mike Bushell. Reigning champion and race two winner Ash Sutton also ran off the road and was delayed in his Team BMR Subaru Levorg. Smiley took charge and was pursued by Rory Butcher in the AmD Tuning MG6 until lap 10, when the Scot slid off at the Deene hairpin, leaving Smiley a clear run to the finish. With Butcher rejoining in sixth, second place was only decided at the very last corner as Colin Turkington’s WSR BMW 125i M Sport capitalised on Simpson, who had recovered from his earlier slip, running wide at the Brook chicane. Turkington launched his car up the inside and beat Simpson off the corner, with the Motorbase Performance Ford Focus of Sam Tordoff narrowly missing out on grabbing a first podium of the season too from Simpson. Turkington said he had gone into the race with an aggressive strategy: “I was concerned about the rain, because those aren’t the best conditions for a rear-wheel-drive car, but I had to go for it. Behind Tordoff in fourth, Tom Ingram grabbed an unchallenged fifth. Butcher followed, while one of the drives of the race came from Team Hard VW CC man Bobby Thompson, who advanced from 28th to seventh. The top 10 was rounded out by race one winner Adam Morgan (Ciceley Racing Mercedes-Benz A-Class), Ollie Jackson’s AmD Tuning Audi and the Team Dynamics Honda Civic Type R of Dan Cammish. The results of the weekend’s three races mean that Turkington leads the standings by four points from Ingram. Reigning champion Sutton is 32 points adrift in third.